To celebrate the changing of the seasons we go out after work and have a few drinks and a bite to eat. As usual we ended up starting in The Old Joint Stock which is a Theatre/Bar in the heart of Birmingham. As one of the round of drinks was being bought I decided to have one of the posh bar snacks instead of another drink as I was still tackling my first (Bottle Green Cox's apple - nice enough, but not as good as the elderflower). 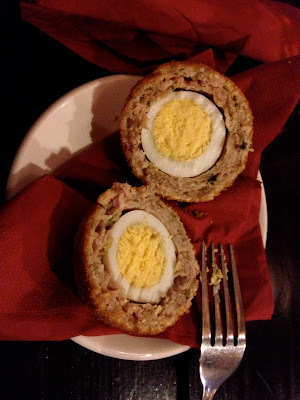 I opted for the Scotch Eggs that they had on the bar - I think the sign suggested they were hand made or home made or similar. Either way they looked a lot more interesting than your typical supermarket version. It's quite large! 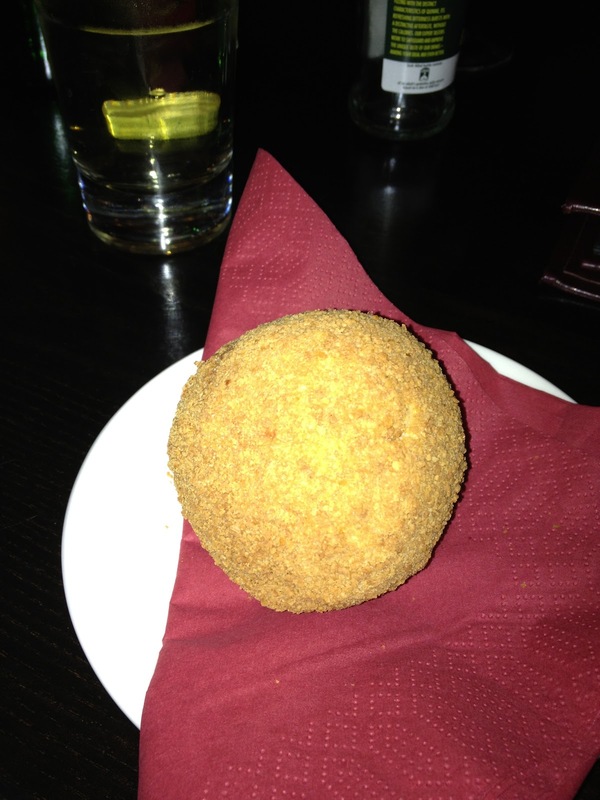 For those that are unfamiliar (is this an international dish?!) it's a whole egg wrapped in pork/beef sausage-meat with a crumb to hold it all together. It's cooked but eaten cold with salad, or in this case a drink. And here is what it looks like on the inside. And the scale fork is actually quite a large one! I cut it up into smaller pieces so that other people could share in this unusual pre-Thai meal starter. The egg is well cooked and of a good quality so the focus here is on the additional bits. We decided that the meat seemed to be pork, which was well seasoned but lightly so, and the crumb itself was also light and less obtrusive than a supermarket version. This was very enjoyable and would be quite filling if it were not shared. I think the size means that it's just a bit too big to eat like an apple, but it's something I'd certainly rank higher than expensive crisps and nuts and something I'll happily sample on future visits.